The Dad | Entertainment, Jokes, News and Stories for Modern Fathers. Throw out everything else in your closet. We&apos;ve got you covered. Get ready to start those engines! Mario Kart Tour, the highly anticipated spin-off for mobile devices, is almost here! Despite knowing next to nothing about this iteration of the timeless racing simulator (literally, not a single screenshot), developers are now accepting submissions for a sneak peek of the game. A closed beta for the game will be available to Android users in both the US and Japan between May 22nd and June 4th. Fear not, iPhone users—the final product will be available on iOS devices as well. If you feel like hopping in the driver’s seat for a preview of the game, use your Android device to apply here. Heads-up, you’ll need to register an account with Nintendo that’s connected to a Gmail account. As we mentioned in a previous article, the game has continually been postponed in the past, but its release is now officially scheduled for Summer 2019. Hooray for another weekend, or two-day-vacation-with-kids as I like to think of it and this one has an Avengers Endgame theme. It’s all about disconnecting with the daily drudgery and making some memories with your little ones. It doesn’t matter if you’re building something or just being silly, commit to whatever you’re doing and have a good time. It’s been a long time coming, with plots, sub-plots, and supporting storylines all coming to a dramatic end. The finale of the Avengers movies has been released and we get to see who survives, who doesn’t, and what happens to Thanos. Since 2008’s Iron Man, we’ve been brought along for thrill and been enticed into theorizing the next twists along the path to save the universe from monsters and really, really bad guys. Getting tickets on the opening weekend might be challenging for some, so the next best thing would be to prepare by hosting an Infinity War fam jam. Or choose a few of the 22 other Marvel movies we suggested in a previous edition. Oh, and make sure to brush up on the complete array of post-credit scenes here. 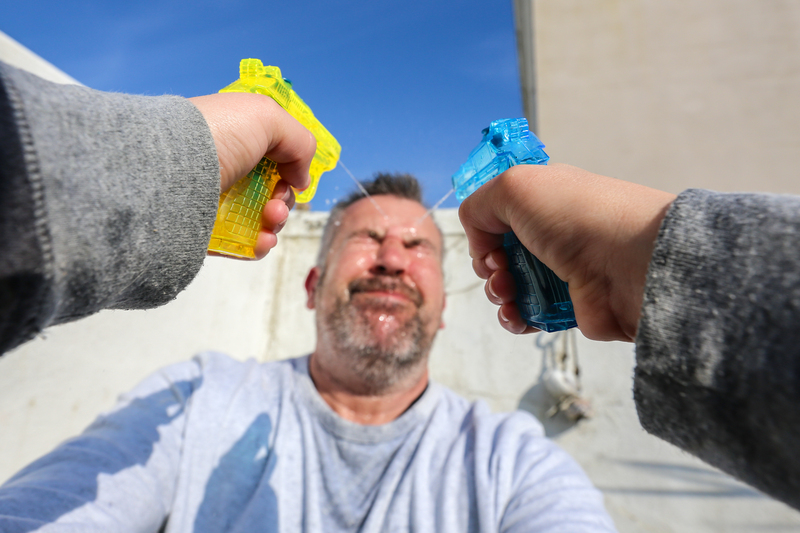 Spring has sprung so fill up some water balloons and break out the water guns. And since it’s a superhero-themed weekend your kids can pretend to be their favorite Avenger. Then they can pick a supervillain target. Maybe dad can be Thanos and your kids can TRY to take him down once or for all. Every awesome superhero movie originated as a comic book so it’s time your kids channeled their inner Stan Lee. Have the kids create their own hero, change an ending or even introduce themselves into a story. Use one of these printable templates from Picklebums to bring a new story to life. They’re also perfect for bringing to school and sharing with friends on Monday morning. The final season of HBO’s “Game of Thrones” is now underway and fans around the world have been speculating how the series will end. Who will sit atop the Iron Throne? Who will be left alive? Will Tormund seal the deal with Brienne of Tarth? A luxury tour company, Unforgettable Croatia, has announced they will give one lucky winner a seven-night trip to visit many of the hit show’s various filming locations including guided tours, five-star accommodations and more. The catch? You have to guess how it all ends. The tour company notes on the contest website that it’s hard to predict exactly how things will turn out, but says that’s one of the best parts. Home to many of the shows most familiar locations, Croatia has seen a dramatic boost to their tourism industry since the show first came on the air in 2011. The trip for two includes stops in Split, which fans will recognize as the City of Meereen, as well as Dubrovnik – home to King’s Landing. In addition, the winner and their guest will also take to the seas in a speed boat trip to visit the island of Hvar, better known to fans of GoT as Slaver’s Bay. While it’s unlikely anyone aside from the cast and crew truly know how things will end up, Unforgettable Croatia’s website suggests answering questions such as: What character will end up on the Iron Throne? Will Jon make a claim? Will Danearys reunite Westeros with her dragons? The official contest rules do note, “the winner is at the full discretion of Unforgettable Croatia.” adding if no one is ‘correct’, the company will pick their favorite. It’s worth mentioning that this lavish excursion will not include international flights and other expenses – That’s on you. Additionally, unlike the show, entries must be 1,000 characters or less. The contest is open now and entries are due no later than May 5th, 2019. Full contest details can be found here. Nickelodeon just announced that it’s boldly going where it’s never gone before and developing a brand new Star Trek cartoon series. No news regarding art design or specific characters yet, but we expect it to continue along the same lines as classic Ster Trek shows, with serialized episodes that can stand on their own as individual installments. With the demographic being much younger than those of past series, show writers will likely focus less on sci-fi elements and more on the relationships and inclusive message that Star Trek has always pushed. The series is set to broadcast on Nickelodeon rather than CBS, but if you’ve gone ahead and cut the cord (like all those damn millennials), you’ll still be able to get your Trek fix when Sir Patrick Stewart reprises his role as Jean-Luc Picard on his own series coming out later on CBS. In 2006, facing an uncertain future, the people behind the James Bond movies course-corrected. After a collection of increasingly ridiculous movies featuring Pierce Brosnan as Agent 007, the series was out of step in a gritty, hand-held Jason Bourne world. So they rebooted, tapping short, blond, Daniel Craig as the star and started the story over from the beginning. Despite a lot of controversy over the casting, it worked, and Casino Royale was a huge success. It paved the way for four more Craig-led flicks, all of them slightly more grounded in reality (at the very least, there were no invisible cars) and some of them, Skyfall in particular, have landed among the best in the series. Almost 12 years later, the series is at another crossroads as rumors of Craig’s imminent departure have swirled around the last few entries. But he’s still Bond, and today Craig’s latest – and last? – outing, his fifth and the series 25th (!) was announced this morning, via a live video event on Twitter that featured director Cary Fukanaga, producer Barb Broccoli, and much of the cast. Craig is back, as are Ralph Fiennes, Naomie Harris, Lea Seydoux – having co-starred in Spectre, she is the rare Bond girl to make a second appearance – and Ben Whishaw as Q. The movie is being directed by Fukanaga, the man behind the McConaissance – or at least some of it, thanks to the first season of HBO’s True Detective – the 25th James Bond movie features recent Oscar winner Rami Malek as the British super-spy’s latest foe. Ana De Armas (Blade Runner 2049) joins the cast in an unspecified role, but is rumored to be the new Bond girl. After being announced, Freddie Mercury himself had a message for the fans, in which he assures them that Bond “won’t have an easy ride of it” in this movie. Bond, having left active service and is enjoying a tranquil life in Jamaica. But his peace is short-lived when his old friend Felix Leiter from the CIA turns up asking for help. The mission to rescue a kidnapped scientist turns out to be far more treacherous than expected, leading Bond onto the trail of a mysterious villain armed with dangerous new technology. The big piece of news we didn’t get? The title. The latest rumors suggest it may be “Shatterhand” but there was no confirmation. Check Bond’s Twitter for the full details. COLUMBIA, SC – Having to make a difficult decision between the two things he loves most, local father A.J. Smith reluctantly conceded that it was time to begin saving for his son’s college, even if it came at the expense of keeping his front lawn lush and trim this coming summer. “My son’s education is of the utmost importance, definitely not winning our neighborhood’s best lawn competition,” said A.J. through his teeth, who noted that he had come in second the past several years and would probably remain the runner-up so long as the money he was saving for a new mower was instead allocated towards a future Ivy League tuition. As A.J. began transferring funds from one account to another, he noticed his single, childless neighbor watering their perfect lawn across the street, confident that they would win this year’s competition since they had no loved ones to spend money on—money that could otherwise be put towards much-needed lawn maintenance. It wasn’t until moments later that A.J. perked up as he found a discounted lawn gnome on Amazon, which would surely solidify a top-3 finish even if it’s all he could afford. The 80s was a magical time for pop music. It didn’t matter what colorful, quirky, or harebrained idea producers came up with—it would probably work. Yes, that is Will Smith in his rap persona, The Fresh Prince, before the hit TV show. Yes, that is a Thriller-esque version of Freddy Krueger, complete with leather jacket and high-tops. Yes, this is probably the most 1988 thing you will ever see. The track actually made it to No. 15 on the Billboard Top 100 and the video was a common sight on MTV, but when it didn’t land a spot on the soundtrack for A Nightmare on Elm Street 4: The Dream Master, New Line Cinema wouldn’t give them the licensing to use Freddy’s likeness or the Nightmare theme song. This resulted in the video being pulled from just about everywhere. The song essentially faded away into history, with this proper version only recently being uploaded to YouTube by DJ Jazzy Jeff himself. Will Smith has yet to comment on whether or not he’s happy about the video’s resurgence, but either way, this campy jam is 100% my new ringtone. Charlene came into my life 13 years ago when I began to date her mother. When I first laid eyes on the little girl, I was in love instantly. Her father wasn’t in her life and still to some degree is not. I ended up marrying Charlene’s mother 10 years ago and helped raise her as if she was biologically my own.